Raise your love for pizza to a whole new level with this portable stainless steel Mont Alpi pizza oven, which comes equipped with a pizza stone and a 12,000 BTU burner. Take this oven with you for camping trips, picnics or dinners at the beach. You can also use it to cook large meat cuts or bake casseroles.12,000 BTU burnerPortable grill is easy to take on camping trips or other outingsUses propane gas and electronic ignitionComes with temperature gauge and catch pan for hassle-free cookingMade of durable stainless steelSilver colorSome assembly requiredAssembly Required. You can also use this. Portable pizza oven. Grill Category Portable. Made of durable stainless steel. Stainless steel cooking grid. Material Stainless Steel. Grill Grate Material Stainless Steel. Color Silver. The Pizzeria Pronto® is a revolutionary new pizza oven from the makers of pizzacraft. The oven pre-heats in 10 minutes and cooks a pizza perfectly in 5 minutes – and then is ready for another pie! We are auth. The Mont Alpo table top pizza oven, A great addition to any patio, RV or Camp site. Elegant and functional. Also great for baking outside, use as your outdoor patio or camping oven. Enhance your patio, outdoor island or camping experience with this award winning and versatile oven. The Baker Stone portable gas pizza oven box gives you wood fired performance on the go. oven is removable to allow for easy transport, or use optional griddle or grill grate accessories (not included) to expand the functionality. Countertop Wood-Fired Pizza Ovens. Uuni makes it easy for anyone to enjoy authentic Neopolitan style wood-fired pizza in your outdoor space. The patented Uuni 3 pizza oven reaches temperatures up to 932 degrees Fahrenheit in 10 minutes and can cook a wood-fired pizza in 60 seconds. Countertop Gas Pizza Ovens. The Mont Alpi Portable Propane Pizza Oven lets you bake delicious, crispy pizzas anywhere you go. A temperature gauge on the door lets you see when your cooking temperature has been reached. Your Outdoor Pizza Oven is lightweight, portable and safe on any surface. It's incredibly easy to use; simply hook it up to a propane tank, turn it on, let it pre-heat for 15 minutes, and you're ready to go. Uuni 3 portable wood-fired oven with a baking board for cooking outdoors. Pizza Oven Stainless Steel Electric Counter Top Kitchen Bake Snake Portable Alfrescamore means "for the love of the outside" and after adding one of these outdoor pizza ovens to your patio you may never want to cook inside again! The Alfrescamore Outdoor Pizza Oven was born from our love of crisp, brick oven style pizza. It's been designed with the cooking ability of professional brick ovens, but with the accessibility, ease and size of a portable grill. Designed to replicate the perfect pizza environment of a brick oven, it uses convection, conduction and reflected heat to create high air temperatures and an even cooking surface. 15,000 BTUs work to cook pizzas in as little as 5 minutes. 17"x18"x20". 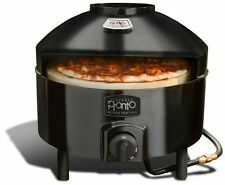 The Mont Alpo table top pizza oven, a great addition to any patio, RV or Camp site. Elegant and functional. This oven gets to heat in no time and cooks gorgeous flame fired pizza in under 5 minutes on the stone included with the oven. Also great for baking outside, use as your outdoor patio or camping oven. This unit performs exactly the same as your indoor oven would. Roast a chicken, joint of beef or the thanksgiving Turkey on this phenomenal piece of equipment. Enhance your patio, outdoor island or camping experience with this award winning and versatile oven. The oven is converted to natural gas very easily with little cost and time involved. Pizza Oven Portable Perfect Cooking. Pizza stone included: Yes. U shaped stainless steel burner. Can be used with a 20 lbs propane tank. Fuel Type Natural Gas, Propane. Product Weight: 27 lb. External Material: Stainless Steel. BigRED HOT! This number is the papa bear to the Maximus Arena. At only 300lbs, it acts like it’s one of the big boys. This is a super cool modern wood fired pizza oven that heats up in only 30 minutes. This number is the Papa Bear to the Maximus Arena. At only 300lbs, it acts like it’s one of the big boys. This is a super cool modern wood fired pizza oven that heats up in only 30 minutes. The quality is superb. 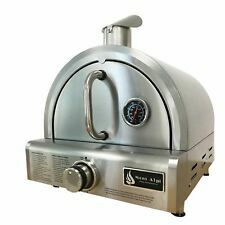 Brand Name: Uuni Sub Brand: 3 Number of Burners: 1 burners Fuel Type: Multi-Fuel Color: Stainless Steel Product Type: Pizza Oven Heat Thermometer: No Tank Included: No Depth: 8.6 in. Ignition Type: Manual ANSI Certified: No Catch Pan Included: No Packaging Type: Boxed Grill Light Included: No Finish: Brushed Width: 14.1 in. Grill Type: Table Top Side Burner: No Height: 25.2 in. Cooking Area: 26.4 sq. in. Assembly Required: Yes Grill Material: Stainless Steel. Freestanding Gas Pizza Ovens. The oven uses convection, conduction, and reflected heat to give you high heat and an even cooking surface. The hinged lid makes it easy to remove your pizza from the cordierite stone using the peel included with the oven. The Alfrescamore Outdoor Pizza Oven was born from our love of crisp, brick oven style pizza. It's been designed with the cooking ability of professional brick ovens, but with the accessibility, ease and size of a portable grill. Ooni Pro Wood Fired Portable Pizza Oven by Ooni. Fast: heat your Ooni Pro up to 932ºF (500ºC) in 20 minutes. Ooni Pro Oven. Ooni Pro Manual. Ooni Warranty. The super-versatileOoni Pro cooks 60-second pizzas, perfectly seared steaks and mouthwatering stews right in your backyard. Outdoors 2 Burner Portable Stainless Steel BBQ Table Top Grill 22" x 18" x 15"
Btu's per burner: 10000. This 2-burner stainless steel tabletop grill is built for the BBQ-grillers on the go. 1x Gas grill. Foldable legs and lockable lid for portable transport and storage. Material: 430 Stainless steel.